and FableVision CEO Paul Reynolds, including a special screening and book signing! What does it take to ensure your school district is embracing critical 21st century skills? EdLeader21 and FableVision are hosting an open house and reception for 21st century education leaders. Come join the dialog as Ken and Paul lead conversation around the 4C’s: collaboration,communication, critical thinking, and creativity. There will be a special screening of Above and Beyond, the short animated film about the 4C’s created by FableVision, which was the inspiration for the Going Places storybook by Paul & Peter H. Reynolds. 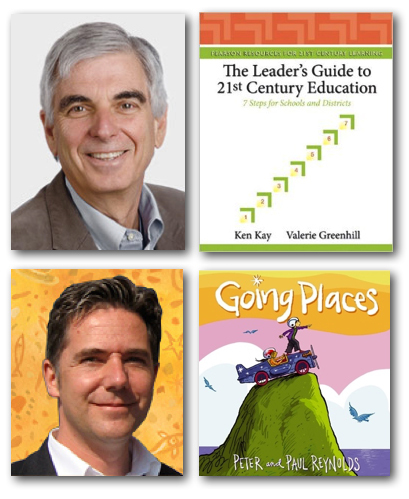 Ken will share insights from his book The Leader’s Guide to 21st Century Education, after which he and Paul will sign and personalize their respective books. Space is limited, so save your space early here. and to learn more about FableVision, visit FableVisionStudios.com.